This is a small but very showy, deciduous tree known for the prolific pink blooms that cover it before the leaves come in. The effect of the masses of flowers is stunning and they turn to small reddish-purple seed pods that hang onto the tree through winter, unless you remove by banging with something like a badminton raquet or other light implement. 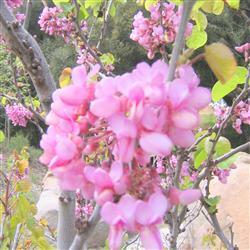 It is sometimes confused with an Orchid Tree by inexperienced gardeners. It is usually a multi-branched tree, but is also available as a single trunk, or standard. After flowering rounded apple-green leaves announce that spring is here, as the season progresses the leaves turn blue-green. Western Redbud makes a fantastic patio or large container tree, as well as working well in a perennial border, or amongst lilacs, manzanitas, or taller trees. We have read that the flower buds are edible, but have yet to try them.